This layered vegetable cutlet recipe came up as a A+B+C+D dish. Tasted yummy and filled everyone's stomach. Has vegetables,cottage cheese(paneer),bread and spices. Vegetables and cottage cheese(Indian paneer) makes it high on essential minerals, protein and other nutrients. Hung curd when used makes a delightful and low-cal substitute. - Crumble paneer(Cottage Cheese) or roughly press hung curd. - Mix spices into it and make soft stuffing. Crumbled cheese to which red chilli flakes and oregano may be added. Gives a gooey yummy center that children can't get enough of! - Do not boil the vegetables till too soft. Drain water and leave on strainer till dry. - Mash lightly, mix salt, pepper and crushed ginger-chili. - Mix in mashed potatoes and crumbled bread slices to make mixture for outer layer. - Stuff in cottage cheese/hung curd mix. Seal well. You may make round or heart shape as you like. - Roll in semolina or breadcrumbs and shallow fry or cook on a skillet(tava/girdle)till light brown on both sides. Now this is one hell of a snack, that everyone around the globe loves. It is in fact the most preferred snack with tea in many places than I have been around. It is available in different content, shapes and sizes too. Thanks everyone..I love cutlets and experimenting to make new yummy ones. Mathangi, the idea of rolling it like a kaju katli is really good.. I avoid dipping cutlets in wet covers (like all purpose flour) as they tend to absorb more oil when being fried, so i use a dry,'dusty' base to coat them..i roll them in dry all purpose instead. Rolling them in the 'batter' like you said gives a lovely coat and tastes 'yum',so it is welcome too.. I am yet to make this cutlet but I must say, this photo is making me drool. Thank you Sumitra for this recipe. My family loved this. My daughter loves cutlets and this variation given by you was a success too. Thank you Matangi for your suggestions too! Wish you both a great day! Apart from the ingredients mentioned, one can mix a teaspoon of Saunf - aniseed , 1 string of fresh coriander leaves, finely chopped to improve the taste. Also before shallow or deep frying, the cutlet can be dipped in all purpose flour. [Take a small cup all purpose flour, mix it with water to a thin paste]. 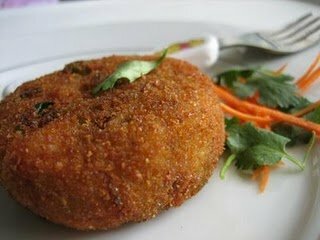 To give attractive look the stuff can be rolled like Kaju khatli and deep fried. It becomes cutlet roll.